The music of America and beyond, celebrating the 60th anniversary of the American Memorial Chapel at St Paul’s.\nSt Paul’s Cathedral Choir and Organists\nConducted by Andrew Carwood\nFanfare for the Common Man - Aaron Copland (trans. C. Driskill-Smith)\nI wonder as I wander - trad. Appalachian\nFive African-American Spirituals - arr. Michael Tippett\nVariations on America - Charles Ives\nAgnus Dei - Samuel Barber\nINTERVAL\nIn the beginning - Aaron Copland\nLargo from New World Symphony - Antonin Dvorak (trans. 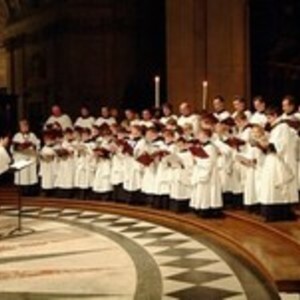 E. Lemare)\nChichester Psalms - Leonard Bernstein\nA chance to hear the most famous Cathedral Choir in the world singing into their own unique and breathtaking space, as they perform seminal American choral works of the twentieth-century. \nDrawing on the anniversary of the American Memorial Chapel, the concert opens with Copland’s celebrated Fanfare for the Common Man, written in response to the US entry into World War 2, and closes with Bernstein’s Chichester Psalms from 1965, a dramatic reflection of the turbulence of the twentieth century, with a finale that invites all peoples to join together in unity. Along the way we encounter the music of slavery and despair, and of joy, wonder and hope.